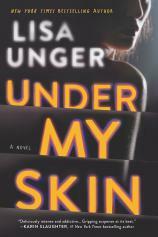 All I can say is that UNDER MY SKIN is unlike anything Lisa Unger has written to date --- and that's a good thing. Her latest book, surprisingly a paperback original, is a departure from her previous work with no reference to the upstate New York town of Hollows that has played a role in some of these prior releases. The narrator, Poppy, is hard to figure out --- mainly because she is having her own issues sorting through events and current feelings, all the while her mind addled by the prescription drugs that help get her through the day. Poppy is still freshly grieving the murder of her husband, Jack. She talks out loud to him, dreams about him, and hassles the police not to give up on his case and continue pursuing the killer. At times, readers will be challenged to decipher actual reality from her skewed version of it, or figure out what is taking place in real life and what is the subject of her dreams. She keeps a dream journal, so when she is actively recording the events from these dreams, it drops a lot of clues and red herrings that astute readers may pick up on before the author decides to reveal the truth about them. At the top of the novel, its title is explained. Poppy is describing her relationship with Jack and the fact that you can never truly know everything about someone, even those closest to you. She recalls staring at him and pondering what was under his skin, that carefully manicured outer layer. This is a natural thought that has probably passed through the minds of most married people. Due to his untimely death, she will never receive the complete answer to that question. "UNDER MY SKIN will not only get under your skin but will crawl up into your brain and toy with you.... This novel cements Lisa Unger's place as one of the top writers of psychological thrillers and is not to be missed." Poppy has regular sessions with her therapist, Dr. Nash, who has asked her to keep a dream journal as part of her therapy. The messages received about her fears, what happened to Jack and other indecipherable visions haunt Poppy as Dr. Nash attempts to relate them to something real that she can work on to help heal her damaged psyche. In addition, Poppy stays in touch with Grayson, the NYPD detective who worked Jack's case. She has unresolved issues with him --- he was never able to solve Jack's murder, and now she feels he is willing to let the crime get filed away as a cold case. Things take a dark turn when Poppy starts receiving flowers, delivered directly inside her apartment, with creepy notes like: "I remember you. Don't you remember me?" She begins having difficulty separating dreams from reality as her dreams have been haunted by a hooded figure who she thinks must be the stalker sending her these messages. As she attempts to get her life together, her co-workers insist that she get back out there and date again. She rebuffs requests to have drinks with Rick from Accounting, but agrees to a date with Noah, a young artist. When Detective Grayson finds out about this, he shares with Poppy that Noah has a history with his ex that includes allegations of stalking behavior. She suddenly wonders if Noah could be the hooded stalker in her life. Poppy decides to meet Rick for drinks. As she walks out of the bar, she begins to feel woozy and Rick takes a firm grip on her. Coming to her rescue is none other than Noah, who beats up Rick for good measure. Poppy soon loses consciousness, wondering if this was just another dream. It is at this point that Unger introduces us to Part Two: “Awake.” With a title like this, you immediately wonder if everything you have read up to that point was just a dream. We now find Poppy living with Noah in his upstate New York home, far from her previous locale in the heart of Manhattan. She wonders to herself if life without pills will allow her to separate her dream state from reality. Just as things start to get really bizarre, we are hit with a shocker of an ending that neither we nor Poppy will see coming. One statement she makes about the alleged killer gave me chills: "....that's the trick of the abuser, soft one moment, a monster the next. Unpredictability is his best trick." UNDER MY SKIN will not only get under your skin but will crawl up into your brain and toy with you. Poppy is a unique protagonist who requires our pity, and her questionable judgment makes us concerned for her well-being. This novel cements Lisa Unger's place as one of the top writers of psychological thrillers and is not to be missed.